EDIT: Within 7 hours of posting this someone pointed out that the 900px action actually resizes to 1000px! This has now been fixed, but you may wish to download to action again, sorry! Many photographers professional and amateur alike currently use my web resizing action as a quick way to produce critically sharp images for their websites and social platforms. This is the latest update which adds additional sizes (including Facebook default sizes) and the ability to add a customisation to the end of every action. Most of you will probably just want to get using the action and ignore the largely unnecessary waffle below, so here it is! Click on the action named ‘Optional Customisation (Step 3)’ and press the record button. Use the keyboard arrow keys to move the text layer so that it isn’t touching the edges. There are a few factors that can affect the output of a web image. To get the most out of the action you may need to adjust the layer opacities to prevent the action from oversharpening / undersharpening your image. Unfortunately the action cannot see how sharp the original image is, nor how large it is, so it can require some modification. In my experience using this action on hundreds of images it is very well set up to produce sharp images from 15+MP images that have been well captured. Note that if you have already sharpened the image prior to running the action the result is more likely to look oversharp. Photoshop’s ‘Save for Web’ is very good at producing high quality jpegs with very small file sizes. I would strongly recommend using a range between 50 and 80. Quite often I use a compression setting between 60 and 70 because I think this gives a good balance between quality and file size. Going above a quality setting of 80 produces very minor improvements to image quality, but quickly increases the file size, I would avoid doing that. Going below a quality setting of 50 uses such heavy compression that artifacts start to become easy to see. Images with fairly little detail (for example silhouettes against a blue sky) will have much lower file sizes anyway, so I might use a quality setting of 80 so that artifacts become essentially invisible whilst the file size is still small. The smaller the file size the faster people can see your images, given that people sometimes have slow internet speeds (or short attention spans) making your image file sizes as small as possible is very worthwhile. Once you have produced your web image it’s now time to upload it. Having spent time making your image look as detailed as possible you upload it to a website only to find that the image quality has been destroyed! Facebook is probably the worst offender. Websites do this to make your files as small as possible to minimise the bandwidth use and improve user experience (faster page loads). This isn’t something that photographers want, but fortunately, aside from Facebook, most major sites are pretty good in this respect. To avoid the facebook compression you should ‘Save for web’ as a 24 bit PNG. The drawback is much larger file sizes (and correspondingly longer loading times for people viewing your images). Written by alexnail, posted on 10th September 2014 at 10:40 pm, in News, Tutorials. Permalink. RSS feed for this post. Thank you Alex 🙂 All the best ! Many thanks for the free download Alex, I will certainly make good use of it. Strange, it does work. What system/browser? Apologies for the delay in replying. I strongly suggest using sRGB for everything and always using sRGB. There really is no good justification for any other colourspace in my opinion. The colours of expanded gamuts rarely (if ever) occur in nature. I really see no benefit. That said I have heard of this issue before where people see colours change even if they are using sRGB throughout and it is often down to the browser! Lot of people also view websites and images from their smartphones and tablets, many equipped with high DPI diplays ( several of them easily > 200 ppi). So in that context, it would be nice for me to upload high DPI images to web to truly make the content stand out. Your script/action does a great job, albeit at a default DPI of 72. Is there a way to customize the script to make it run @ 200/300 dpi ? that would be phenomenal and would look awesome on the latest gen “retina” smartphone/tablets. Thanks a lot for your inspiring work. I’ve just discover your website a couple days ago and I’m still fascinated with your awesome imagery. I’m trying to download the Web Sharpen V4 but it seems the link has been cut down or maybe my laptop configuration it’s not properly to download it, could you help me please? Sorry I forgot to reply to you. The link is now fixed! Thanks for pointing it out. Im having trouble downloading this action, it seem to be deleted? Fixed now, sorry it took so long! Hi Alex, Read your post about sharpening and then tried downloading the actions, but it says the file is not there anymore. I really love your action, I used the earlier version. Now I am using CC2015 and wanted to try the actual version of your Rezise for Web. I am able to start the action, but there is no rezize done. I just get two new layers, Sharp and Sharper and than everything stops. Is that because of the use of CC2015? Possibly Martin, I will look into this and recreate the action set if there is a problem with CC 2015. I’ll email you! Fabulous actions. Absolutely brilliant for social media applications. My question is, can I alter the script, or can you create a script, that would enable me to have a 3000px wide image? This would be very useful for me to send images to clients, as 2000px is just that little bit small for them. Sorry for the delay in replying. It should be quite easy to create your own action for a different size. If you open up one of the actions you can see the process used, just record exactly the same thing. On your first downsize you will want to drop down to 5000px wide if 3000px is your final output size. thanks a lot for updating these action over the years, I use them for every image. 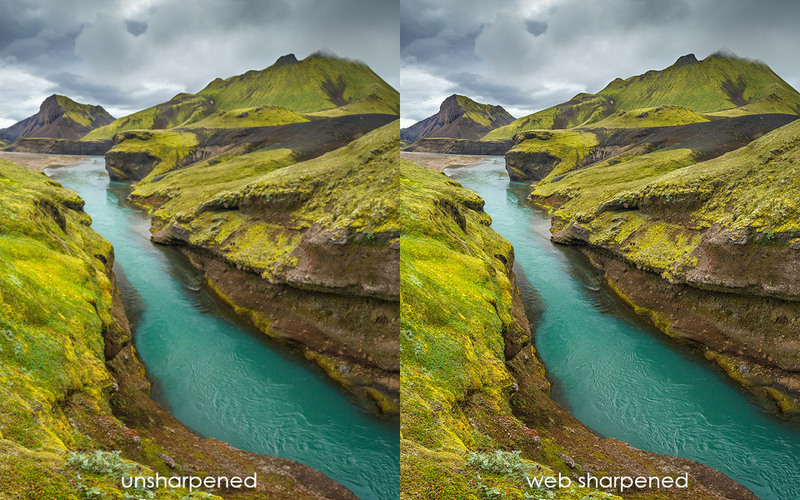 I just did a comparison between your old script(probably v2), this v4 and the Web Sharpener from Andreas Resch. After a lot of testing with different images and different sizes, I found the old v2 works best for me. v4 has a tendency to oversharp your images. Sure you can correct that with opacity slider, but V2 does the job for me so well. Thanks for providing again! Good to hear from you and I’m glad that you’ve found it helpful. The action sharpening amount (opacity) you want to apply will vary depending on the original image size, the original image sharpness and of course personal taste. It would be quite easy to modify v4 to bake in the opacity that you want, but if v2 does the trick then that’s great. Hey Alex, I’m a very passionate landscape photographer who cares about even a little detail of the whole image, so I am very glad to find your way of web sharpening technique used by a lot of great photographers. you mentioned Photoshop’s “save for web” function, which is something I’ve never used before. With your action, what do you recommend me to do to get the best result for image quality? like do I need to run your action first, and then apply photoshop’s save for web as the final step of the workflow? Hope to hear from you soon! Yes, that is correct. You run the action and then ‘save for web’. Although if you have the latest version of Photoshop (CC 2015) then this has now changed to: File > Export > Export As. I would suggest setting to jpeg with a quality setting of between 60 and 80 depending on the filesize you want to achieve. Thank you, Alex! Is there particular reason why we only save it for 60 -80 quality instead of 100? Is it a way to avoid compression when uploading to facebook? well, if I want the truly best result for my own view like on my own website, should I set the quality to 100 when exporting it. Also, there is another way of web sharpening , in which I have to re-size the image size by using my intended size x 1.67 while selecting Bicubic smoother (enlargement) and using photoshop sharpen to sharpen it for 3 times and then down size it again to the size I wanted. I found this producing even sharper image in some areas but should I export it the same way as you described? What’s the difference between this “export” and “save as”? Thanks!! I really love your web resize action! I used v2 several years and was always happy with it! Now I tried the v4 and unfortunately – like someone posted before – it isn’t resizing anything for me. 🙁 Images are getting sharpened, but not resized. I am using Photoshop CC (2017). Is there anything I could change for myself to fix this? I would really appreciate your advice. Thank you very much!